Today’s project was literally one of the biggest DIYs I have ever taken on. Not because it was incredibly difficult or something but because it was a long process and the payoff was huge! I taught myself how to reupholster a sofa. It is definitely one of the most dramatic transformations that I’ve done. I found this sofa for $40 at a local thrift store. I already knew what I wanted so when I spotted it with an additional 50% off price tag, I knew it was time to bite the bullet and take on a massive reupholstery project. I’m pretty sure this exact same sofa was in my church building as a kid. Either that or a hotel lobby. I’m also fairly certain that my husband thought I was a lunatic when I sent him to pick it up from the store after I bought it. Don’t worry, I made him see the potential! I got her home and a month later, tore it apart! 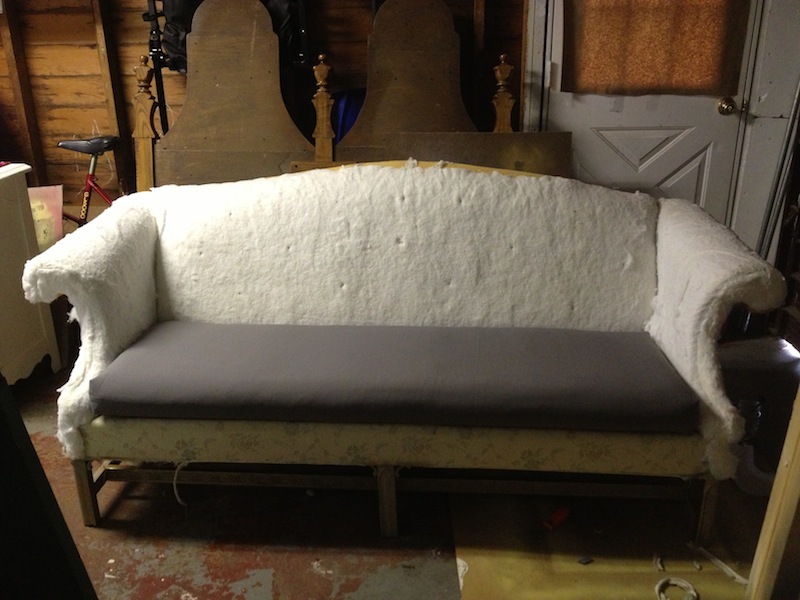 A sofa is not much different that reupholstering a chair or something. You basically take out all 80 zillion staples and remove the fabric to use it as your pattern then put it all back together! Here she is all nakey. When all of your fabric is removed you can refinish the wood legs if you want. I chose not to remove the deck (the part under the seat cushion) but to simply cover it with the new fabric. To paint the legs, I took gold spray paint and sprayed the legs. You can learn how I spray paint furniture here. After it dried, I took some dark grey paint and did a dry brush technique over the gold. I love how the legs turned out. Next, time to make your pattern. I chose a grey suiting fabric and it has held up really well! I love richness of it. I highly suggest using a permanent marker and writing which piece is which BEFORE you take it apart. Like while everything is still intact, write on it “right arm top”, “Back”, “deck”, “front cushion” etc. Seriously, label everything! It will make your life a heck of a lot simpler when you’re trying to piece it back together. I made the box cushion sometime mid-tear down. I needed a break from ripping out the staples so did some sewing with a friend in the meantime. Next up, I recovered the deck and then started the the arms. This was the only other part that needed sewing (around the front curve) so I tackled that next. It is definitely the most challenging part of a project like this but if you cut your pattern pretty closely, it’s not that hard. After the arms, you’re pretty much home free. Oh, I used my air compressor and a staple gun for the whole project. You can get a staple gun for pretty cheap so if you’re into upholstery at all, I highly suggest it versus a hand stapler. A hand one will work but you’re hands will hurt a lot sooner than using the air staple gun. The final step was doing the back of the sofa. If you are not going to tuft, you just slide your pattern piece on and staple it in place, then proceed to the back and put it back together exactly how you took it off. 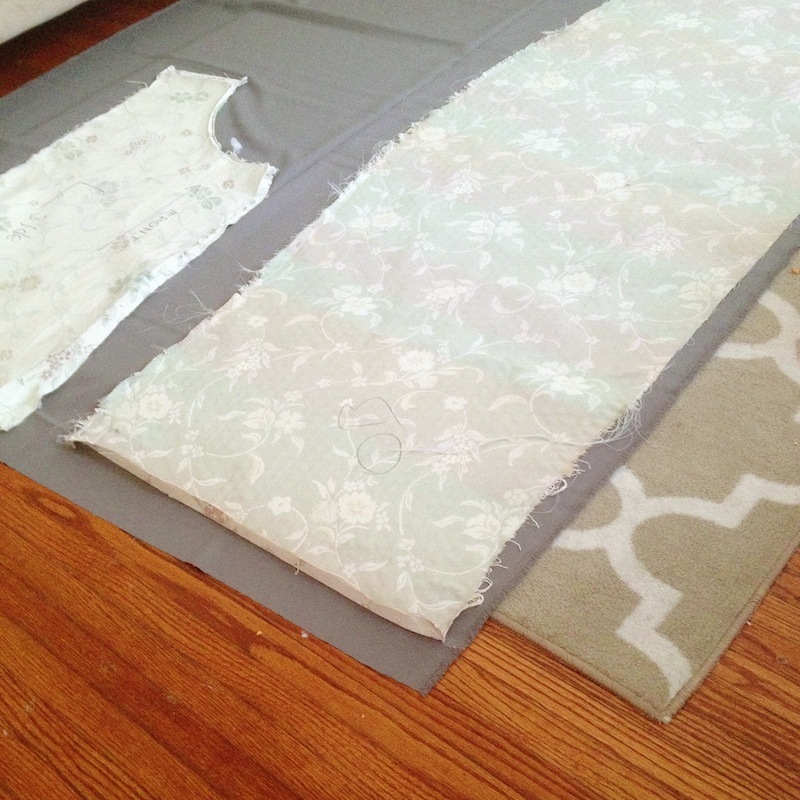 You will probably have upholstery strips to replace for the very back panel. Here’s a secret, since I tufted and I wanted to have access to the back in case we ever lost a button, I opted to use velcro to attach the very back panel. This is totally not the professional way but it is way easier and my sofa is against the wall so I don’t even mind it one bit that it’s not permanently upholstered back there. 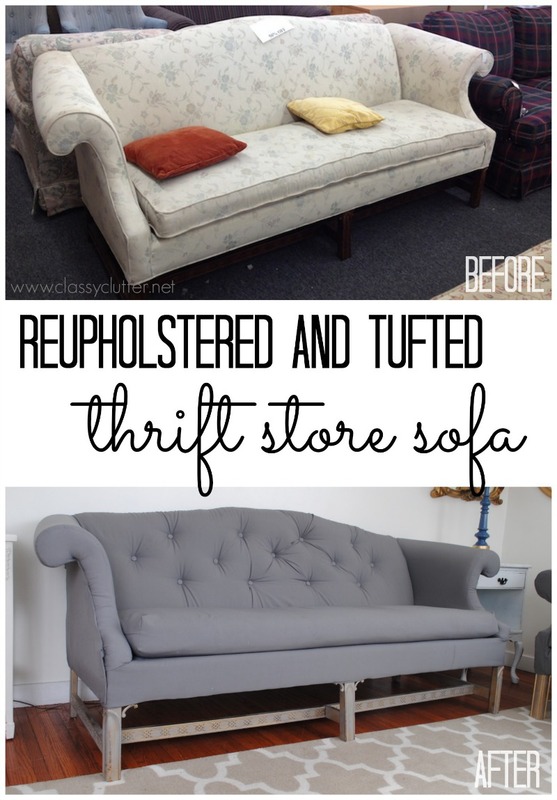 If you are going to tuft your chair or sofa, I will be doing a detailed tufting tutorial really soon. This part isn’t too terribly hard but it is kind of a lengthy step-by-step process so I’m going to break it up a bit for you. 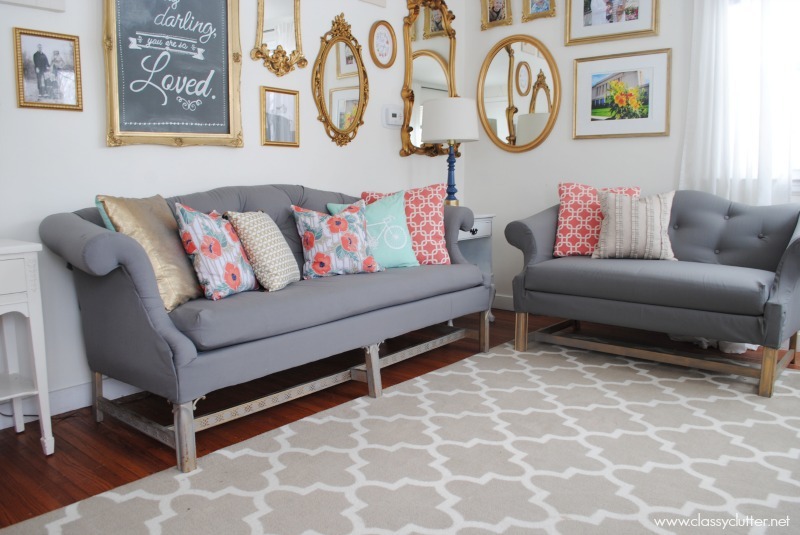 The love seat on the right was almost this sofa’s twin but when I bought it, it had a slipcover so I chose to slipcover it instead of reupholstering it all together. If you look closely, you can see that it is looser fitting than the upholstered one but it doesn’t bother me. 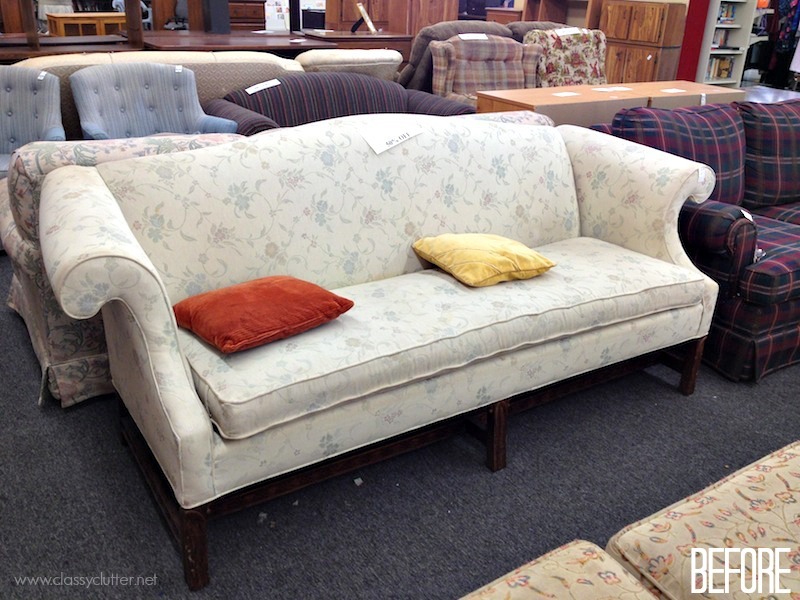 I’m just lucky that I found a semi-match on Craigslist to create my own sofa set. Phew! That was a lot of info! I hope you enjoyed it. What do you think of the final product? I’m super impressed by this! 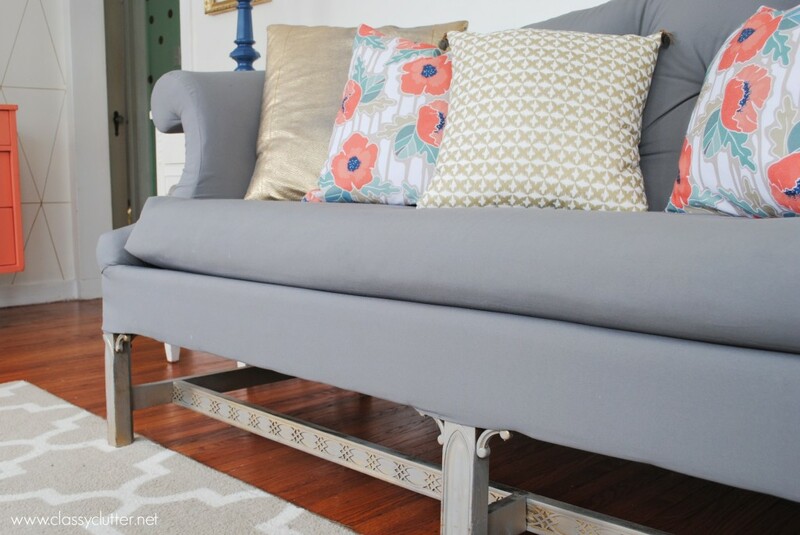 I have upholstered chairs, but have never tackled a sofa….you got me thinking about it. Great job! WOW!! that is so amazing!! You make it look so easy… would you give us a cost breakdown? Looks great, I am so in love with every project of yours and you have even inspired me to do some gold in my own home! Btw what happened to your other sofa? Thank you so much for your sweet comments! You are so sweet! The other sofa is in the garage! We are going to sell it when the weather warms up a bit and we can give it a good cleaning. I love it! Such an inspiration. This is so fabulous! Great job! You have serious skills! And your living room…I die! I love this Mallory!! It is so pretty, great job tackling that project. I too love to torture my husband with thrift store furniture gems 🙂 I haven’t tackled a couch yet, you made it look simple though, haha except I’m not sure about the sewing the arms part! Amazing living room. love it all. Oh my goodness Mallory that is incredible! 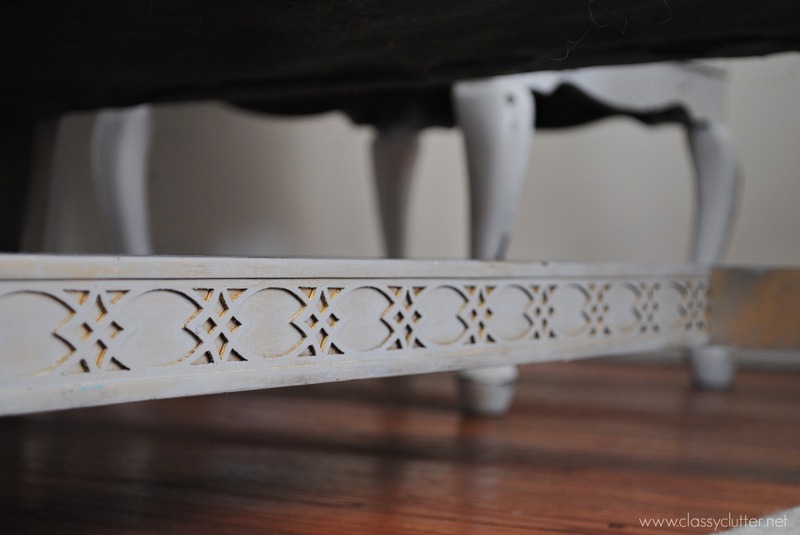 I love how it turned out – and your gallery wall above it is gorgeous too!! Love the old made new and modern again look- such a pretty room!! This is STUNNING! Wow– so beautiful! And I can’t believe how close of a match the love seat is, too! Wonderful, wonderful job! I popped over from Link Party Palooza–thanks for sharing! It’s fantastic!! I can’t believe the transformation! I’ve always been terrified of reupholstery but if I could make something look like this then I totally need to give it a shot! Beautiful job, I love the gray, I love the piece. Love love love it! Fantastic job. I am looking forward to the tufting post. I have a chair with an already tufted back, waiting for me to tackle it. Thanks for sharing! Your sofa came out great! I would be terrified to take on such a project! 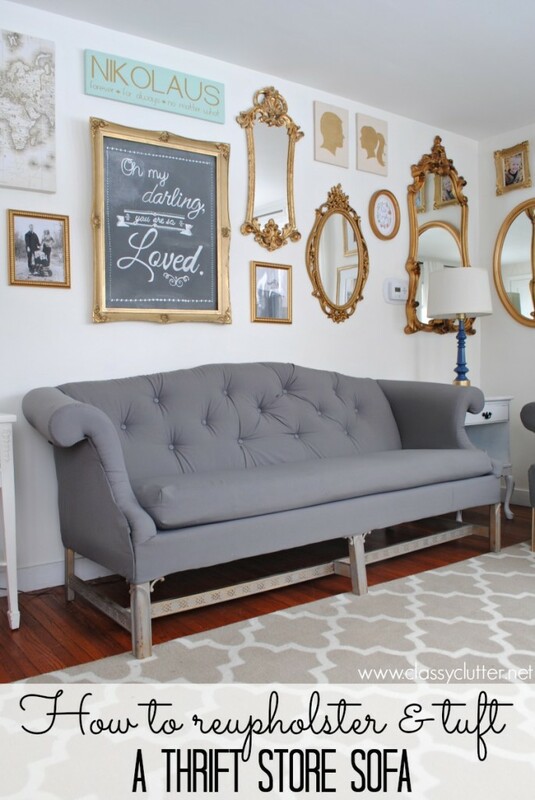 Love, love, love that gallery wall, too! I am super impressed! It looks amazing. I have reupholstered a small settee and recently a chair, but never anything that big. Also, I can’t sew worth a lick, so I’m really intrigued about how you did the sides of the couch, the part you said required sewing? Can you write more about that? It looks fantastic though! WOW it doesn’t even look like the same sofa! I loved that you added the buttons, and kept the original legs. Way to add your own flair to it, the gold wall decor is amazing as well. I’d love if you would come share this at our link party. Hi Amber! I got it at Joann’s but used a coupon! Thanks!! Great tutorial! Just wondering how many yards of fabric you used? 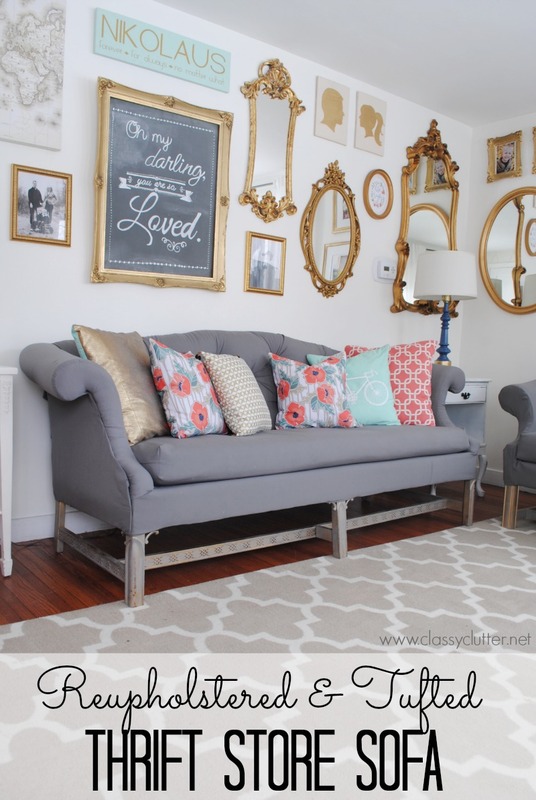 I’m reupholstering a similar sized sofa but have no idea how much fabric to get! 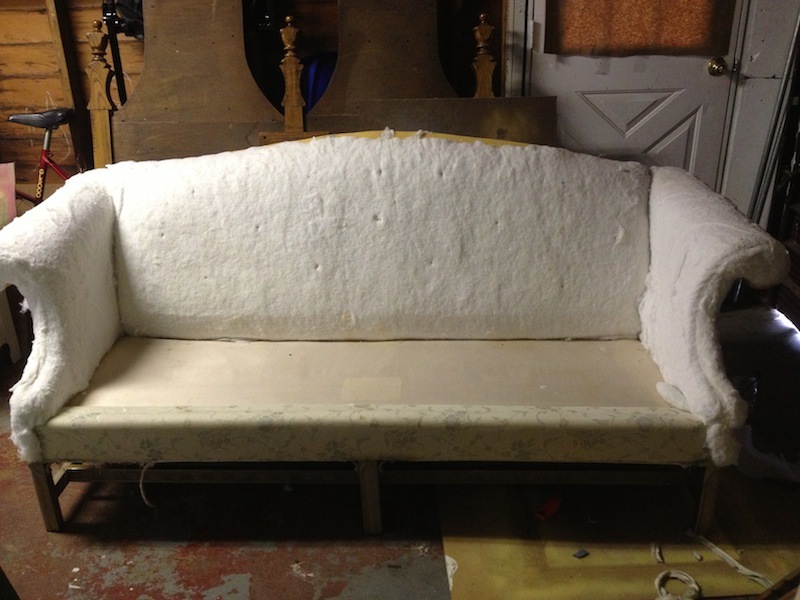 How do you meaure the material…How much do ya need for a 92 inch sofa like this??? Found your post today. I have the same love seat as you that you slip covered. It was my parents and I have saved it for years because the shape is beautiful. But it is in disparate need of refinishing. I’m in debate as to recovering it myself or just making a slipcover. I don’t have a clue how to do either but until I can afford to have it done right I need to make it descant. Do you have advise or instruction that could help me in tackling this project? Wow, this is incredible! I love seeing reupholster projects like this, and you did an amazing job. My couch is almost the exact same shape so this tutorial is perfect for me. I can’t wait to get started on my project. Thank you for sharing! I really love your armchairs! My favorites are in this order – 6. 11. 4. I live in South America and unfortunately we don’t have these wonderful stores like you have to choose from. Very envious!! Hi, you have done an amazing job!!! 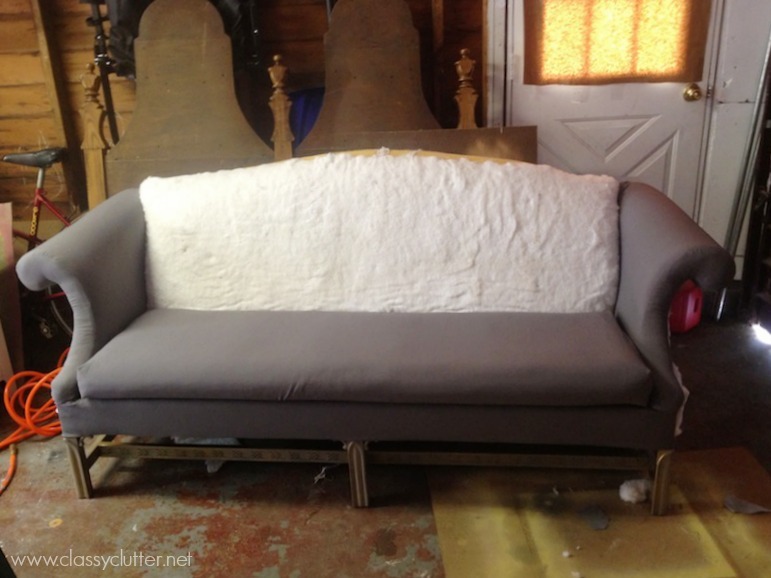 I have the same coach and a love seat that I would love to reupholster (my first attempt ever) and I would like to know how much fabric you have used and how much time did it take you to finish it? Did you put in a zipper in the cushion that you sit on? Mine has zippers in both pieces of furniture. Not sure what to do about it. Hey there, I can’t find your detailed tufting tutorial, do you have a link to that? 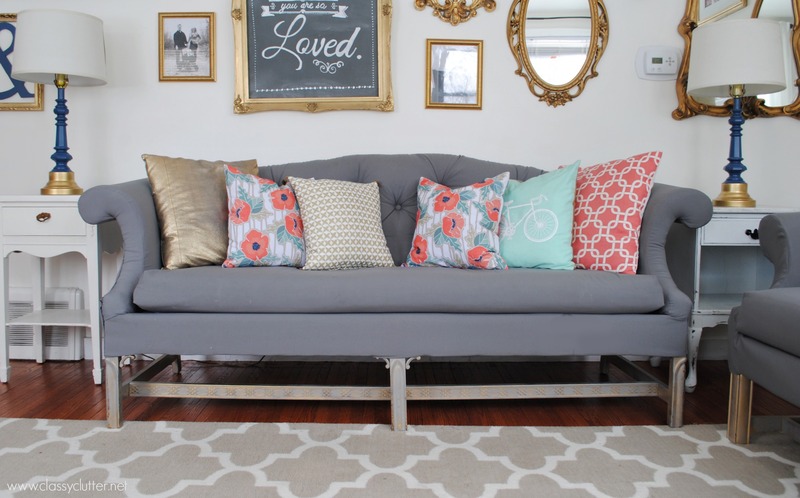 Here is how we tufted our headboard this will give you a tutorial on how to tuft! If you have questions please email us! Colors are just been amazing. I love your choice of coloring that you have choosen in it. You are a good designer it is shown clearly in your designs and other stuffs you have done in your room. Good.